"Fumie" redirects here. For the given name, see Fumie (given name). A fumi-e (踏み絵, fumi "stepping-on" + e "picture") was a likeness of Jesus or Mary onto which the religious authorities of the Tokugawa shogunate of Japan required suspected Christians (Kirishitan) to step, in order to demonstrate that they were not members of that outlawed religion. The use of fumi-e began with the persecution of Christians in Nagasaki in 1629. Their use was officially abandoned when ports opened to foreigners on April 13, 1856, but some remained in use until Christian teaching was placed under formal protection during the Meiji period. The objects were also known as e-ita or ita-e, while the forced test was called e-fumi. The Japanese government used fumi-e to reveal practicing Catholics and sympathizers. 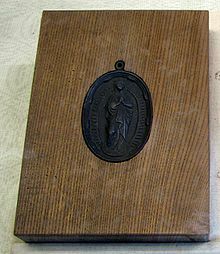 Fumi-e were pictures of the Virgin Mary and Christ. Government officials made suspected Christians trample on these pictures. People reluctant to step on the pictures were identified as Catholics and were sent to Nagasaki. The policy of the Edo government was to turn them from their faith, Catholicism; however, if the Catholics refused to change their religion, they were tortured. As many of them still refused to abandon the religion, they were killed by the government. Executions sometimes took place at Nagasaki's Mount Unzen, where some were boiled in the hot springs. Eighteenth-century Europe was aware enough of e-fumi for authors of fiction to mention it when alluding to Japan, as in Jonathan Swift's Gulliver's Travels (1726), Oliver Goldsmith's The Citizen of the World (1760), and Voltaire's Candide (1759). In modern Japanese literature, treading on the fumi-e is a pivotal plot element of the novel Silence by Shūsaku Endō. 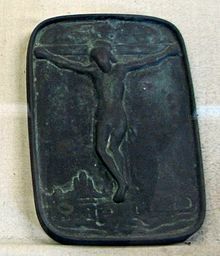 Many theologians have tried to contemplate the role of the fumi-e to Japanese Christians, some seeing the treading of the fumi-e as a sign of the love and forgiveness of Jesus Christ. Fumi-e were usually carved out of stone, but others were painted and some were wooden block prints. Many, if not all, of these works were made with care, and they reflected the high artistic standards of the Edo period. There are very few existing fumi-e, as most were simply thrown away or recycled into other uses. Some surviving examples were displayed by the Smithsonian in their 2007 exhibition "Encompassing the Globe: Portugal and the World in the 16th and 17th Centuries." ^ Shunkichi Akimoto (1961). Exploring the Japanese Ways of Life. Tokyo News Service. p. 233. Retrieved 2011-11-21. Attached to this word is an exotic, foreignized sort of interest though it was a native invention of the early Yedo Period and had remained a curious symbol of the anti-Christian policy of the Tokugawa feudalism. ^ a b Kaufmann, Thomas DaCosta (2004). Toward a Geography of Art. University of Chicago Press. p. 308. ISBN 9780226133119. ^ David E. Sanger (1991-06-07). "Volcano's Fury Turns a Shrine Into a Morgue". The New York Times. Retrieved 2015-12-06. ^ a b Michael North (2010). Michael North (ed.). Artistic and Cultural Exchanges Between Europe and Asia, 1400–1900: Rethinking Markets, Workshops and Collections. Ashgate Publishing. p. 141. ISBN 9780754669371. Retrieved 2011-11-21. ^ William T. Cavanaugh (1998). "The god of silence: Shusaku Endo's reading of the Passion". Commonweal. Retrieved 2011-11-25. ^ Jeff Keuss (March 2007). "The Lenten Face of Christ in Shusaku Endo's Silence and Life of Jesus". Expository Times. 118 (6): 273–279. Retrieved 2011-11-25. ^ Jenkins, Mark (2007-07-20). "Portugal's Unending Sphere of Influence". The Washington Post. Retrieved 2011-11-21. ^ Michael Fragoso (2007-07-11). "Fair Trade with 17th-Century Portugal". The American. Archived from the original on 2013-10-03. Retrieved 2011-11-21. This page was last edited on 19 January 2019, at 20:47 (UTC).